The Pakistani government on Monday distanced itself from an offer by one of its Cabinet ministers to pay $100,000 for anyone who kills the maker of an anti-Islam film, saying the offer does not represent official government policy. The offer by Railways Minister Ghulam Ahmad Bilour has drawn criticism in Pakistan even though anger against the film runs high in this predominantly Muslim country. Bilour said Saturday that he would pay the reward money out of his own pocket. He also appealed to al-Qaida and Taliban militants to contribute to “a noble cause” of eliminating the filmmaker. The film, made in the United States and entitled “Innocence of Muslims,” has enraged many Muslims around the world for its portrayal of the Prophet Muhammad as a fraud, a womanizer and a child molester. At least 51 people, including the U.S. ambassador to Libya, have been killed in violence linked to protests over the film, which also has renewed debate over freedom of expression in the U.S. and in Europe. In Islamabad, the Foreign Office said in a statement Monday that the bounty put on the filmmaker’s head reflected Bilour’s personal view and was not Pakistan’s official policy. The minister belongs to the secular Awami National Party, an ally in the government of President Asif Ali Zardari. The ANP is also the ruling party in the northwestern province of Khyber Pakhtunkhwa. Bilour’s comments appealing to al-Qaida and the Taliban also struck a nerve within his own party, which is considered anti-Taliban and has lost several leaders in the fight against the insurgency. His colleague in parliament Bushra Gohar demanded the party force Bilour to explain himself. A party spokesman Haji Adeel said the statement was Bilour’s personal view, and that the party had sought an explanation from him. On Friday, Pakistan observed a national holiday, which it termed the “Day of Love for the Prophet,” and called on people to go out on the streets to protest against the anti-Islam film peacefully. But the protests turned violent, and at least 21 people were killed. Rioters set fire to government and public property including a church and several cinemas. 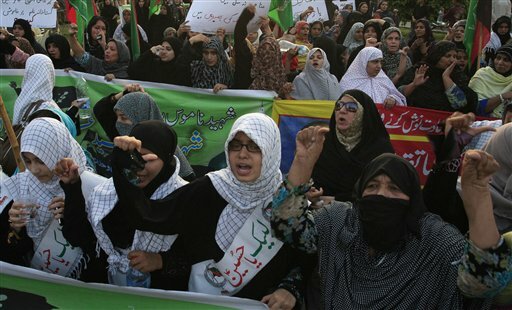 A number of Pakistani militant groups that are officially banned took part in the demonstrations. Analysts and columnists have criticized the Pakistani government’s decision to call a national holiday, saying it was appeasing radical Islamists. Others have said by calling a national holiday the government managed to keep thousands of potential demonstrators outside of the capital since all businesses were closed.